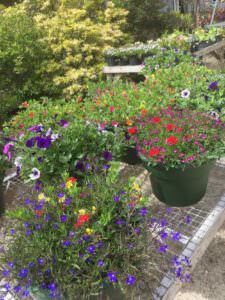 Follow the links below for various guides to prices and varieties of what we currently have in stock. Please keep in mind that these are just general guides to our inventory! 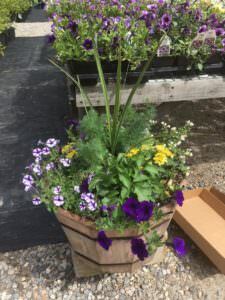 We are frequently restocking your favorite plants as well as trying out new materials. So stop by or give us a call, at Moody’s there’s the perfect something for everyone. The majority of what is listed in our annuals guide can be found in Greenhouse #2. 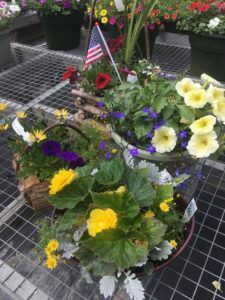 This list does NOT include our selection of geraniums, nor our vegetable plants. The guide to sun perennials does NOT include shade perennials or the majority of our shrubs. As always, feel free to contact us if you’re looking for something specific or have any questions! 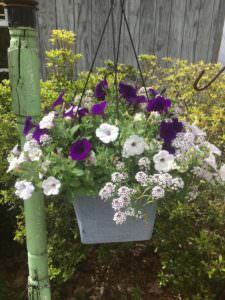 We also have a wide range of beautiful planters and hanging baskets bursting with annual blooms. 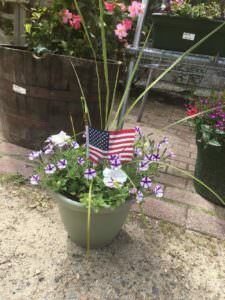 We have whiskey barrels, unique clay pots, classic terracotta, and different sized hangers, all filled with bright colors, calming pastels, or even red white and blue flowers to show off your patriotism through the season. And if you can’t find one that’s just right, we can customize one that perfectly represents you!